A topic sentence is the most important part of a paragraph. In other words, the topic sentence announces—yep, that’s right—the topic! Every paragraph has its own—or at least should have its own—topic. The main idea of every paragraph should be expressed by its topic sentence. The definition of a topic sentence is: a sentence that communicates the main idea of the paragraph in which it is contained. The purpose of a topic sentence is to tell the reader what idea is to be explored in the following the paragraph. No—that would certainly make for dull writing. Communicating the topic of the paragraph should be much more nuanced. It should set up the main idea of the paragraph while also relating to the main idea of the whole paper. That might sound tricky, but it’s not really. You see every paper is really a distillation of a concept. It starts off with a thesis, and each successive paragraph focuses on one aspect of that thesis. Each paragraph has its own topic and, therefore, has its own topic sentence. Now let’s examine what it means to write a topic sentence. There is no one-size-fits-all structure for a topic sentence. They can range in size and shape. The main goal, however, should be the same no matter what the sentence looks like. Typically, the topic sentence will introduce the paragraph. That means it is most commonly found at the start of every new paragraph. The sentences that follow the topic sentence should relate to the topic sentence somehow and act as support. In other words, they should work to develop the idea presented in the topic sentence. If, for instance, your topic sentence discusses the magazine rack in a dentist’s office, the following sentences should also relate to this magazine rack (perhaps by describing the magazines or the rack itself). If the following sentences, however, go on to describe the woman sitting by the magazine rack, or the poster on the wall opposite the room, or the nurse behind the counter, something is off. There should be alignment between the topic sentence and the sentences that follow: those that follow should expand on the idea introduced in the topic. If you want to describe the entire dentist’s office then make your topic sentence focus on the office rather than on a single article within the office. The forms of a topic sentence can vary, depending on how you want to use your sentence within the context of the larger essay structure. For instance, your topic sentence can act as a bridge, linking the topic of the previous paragraph to the topic of the new paragraph. It can act as a pivot, and be buried in the middle of the paragraph (in this case, the topic sentence creates a shift in the main idea of the paragraph). It can act as a question, which introduces the main idea, or it can be a complex sentence (with an independent and a dependent clause). We’ll give some examples of each of these forms below. As a general rule, the topic sentence should give a macro perspective—and the rest of the paragraph can give the micro. In this way, the topic sentence will reflect on the sentences that follow. What does this mean? 2. Be clear and show where the paragraph is heading. 1. Just state the topic. Instead, it should state the topic AND give an idea of how it is supported in the paragraph—i.e., the direction in which the paragraph will go. 1. Be balanced—neither too specific nor too vague. e. Providing details to make your reader more interested. 3. Be formulaic or dry. 2. Act as a transition between the last paragraph and the one you are just now beginning. 1. Relate to the thesis statement of the essay. 2. Connect back to the main point of the paper. 2. Act as a diversion to some other issue that is not related to the main purpose of the paper. The complex topic sentence can be a good way to introduce the paragraph’s main idea. It sets up the main point of the paragraph first by referring to a separate idea, which is countered by the actual main idea that is then explored in the paragraph. While the Internet has created a lot of new opportunities for businesses, there is now more need than ever before for firms to also consider upgrading their cyber security systems. Though the U.S. has been involved in the Middle East since 9/11, it was only with the arrival of Russian forces that the power of ISIS began to wane. Looking back on the 20th century, one can see that a number of political factors influenced the West and made it what it is today. While the electric car has made headlines as the vehicle that will replace the gas guzzler in the future, the fact remains that energy must be produced to power those cars—and fossil fuels will still be used to generate the majority of that energy. Even though the UK voted to leave the EU, few people expect that other countries will soon follow with a Brexit of their own. Because of issues like gun violence and domestic terrorism, many people want to see the 2nd Amendment repealed or overturned—or at the very least restricted. As more and more headlines turn out to be nothing more than “fake news,” readers are turning to alternative media sources for information. While many depictions of strong leaders include traits like “decisive” and “creative,” one characteristic that is sometimes overlooked is emotional intelligence. On-site leadership is one way that human relations managers can be more effective on the job, but another way is through centralized off-site management. While Keats celebrated the ancient philosophy of the Greeks in his “Ode on a Grecian Urn,” Rousseau used the same ancients (Socrates in particular) to insist that the arts and sciences were a hindrance to real learning. Even though quality care is already a primary aim of health care facilities, transcultural nursing can help health care providers to achieve that aim more effectively. If Democratic Leadership is an effective style for leaders seeking to give voice to their team members, Servant Leadership can be effective in providing those same team members with unconditional support and the assistance they need to grow and develop to their fullest potential. As globalization has helped many countries become more connected, it has also caused many people to adopt a more nationalistic stance. Just because off-shoring is not viewed in a negative light by some multinational and international companies does not mean there are no negative domestic effects that stem from it. Though the Electoral College made sense in the beginning, today in an age where technology has enabled every voter to be able to cast a vote directly there are many who believe the Electoral College has outlived its usefulness. While jazz became popular in northern cities, it really got its start in the south in New Orleans. If Frankenstein’s monster initially sought acceptance and human warmth, Dr. Frankenstein himself fled each of these, seeking solace only in the isolation of his laboratory. In spite of his push for progressive ideas, Mao’s reign in China and his Cultural Revolution were in many ways more retrogressive than they were progressive. Even though there are many issues that impact the elderly community in terms of health care, falls prevention is one particular area that could stand to receive more attention. This type of topic sentence lets the writer introduce the main idea of the paragraph by way of a question. It can be an effective way to change up the pace of the essay and keep the reader interested. Why is the obesity epidemic spreading so rapidly in the United States? Have you ever noticed how often political correctness is applied to a situation at the expense of humor? What is China’s role in the global economy? Why do so many nations around the world support the “Iran Deal” that President Obama signed and that President Trump wants to scrap? Will tax cuts really enable businesses to grow and re-invest in American infrastructure? Just how bad has Obamacare been for the health care and health insurance industries, not to mention the average patient? What is the actual nature of the conflict between Saudi Arabia and Iran? What are Israel’s intentions for the Golan Heights and the Gaza Strip? How has the U.S. displayed its military strength in recent years? What did Nietzsche mean when he said that God was dead? What is the cause of the rising cost of education? What can Pandora do to strengthen its business model? How are race and gender issues reflected in popular media? Should President Trump make such frequent use of social media to attack his adversaries? What can brick-and-mortar retailers do to strengthen themselves in the wake of e-commerce’s takeover of the retail industry? How can producers cater to experience-seeking consumers in the 21st century? How is Western religion viewed in a country like India where nationalism and Hinduism are united at the hip? Should the world abolish cash and go to an all-digital currency? The Federalists pushed for ratification of the Constitution, but what was the position of the Anti-Federalists? How did Othello come to give himself over to hate so quickly? What are some examples of 21st century leadership? How does Flannery O’Connor’s “Everything That Rises Must Converge” depict a world in which there is not enough charity to go around? In what way did the Berlin Wall represent the new socio-political order of the post-WWII era? Does marijuana actually have medicinal benefits? How did the Weimar Republic set the stage for the Third Reich? The bridge topic sentence comes at the beginning of the paragraph and references the main idea of the preceding paragraph while introducing the main idea of the new paragraph. The stock market continues to hit all-time highs, but this does not mean the actual economy is doing fine: on the contrary, there are several indicators that suggest otherwise. Yet even though consumer inflation remains low, inflation across several assets—from housing to stocks—is actually on the rise. Still, in spite of what former FBI Director Comey said, the evidence indicates that he did plan to exonerate Clinton before the investigation was actually completed. Other researchers have confirmed as much: Davis (2008) for example showed that diabetes can be combated simply by returning to a natural diet. If qualitative research is more exploratory and even subjective in nature, quantitative research focuses on obtaining objective data that can be statistically analyzed in order to test or verify a claim. The Civil War may not have been totally about slavery, but the slave issue certainly played a part in the politics between North and South. Though Wong Kar-Wai made some very excellent films, not all of them have been well received by critics: The Grandmaster is one such example. Bitcoin may be a bubble, but that doesn’t mean there isn’t an opportunity to make a lot of money by speculating on just how high it will rise in the coming months and years. So while there are many advantages to the concept of cryptocurrency (not the least being de-centralization), the fact of the matter is that it is still very much dependent on a functioning network. The question of whether or not the Fed can ever recover from its application of unconventional monetary policy is a good one, and some, like Kevin Warsh, have argued that quantitative easing (QE) is to blame for the asset price inflation. Broken windows theory can help to explain how neighborhoods become crime-ridden; however, social disorganization theory can also help explain how that happens. Education reform is, therefore, nothing new, but one aspect of education that has begun to receive more and more attention is the topic of Character Education. Health literacy is one way to get patients to exercise preventive care over their own lives, but promoting personal responsibility and accountability is another and goes hand in hand with health literacy. Futures, options, and swaps can be a way to hedge against risk, yet derivatives also carry their own inherent dangers that have to be properly understood before they can be effectively utilized as hedges. King David was certainly a heroic character as depicted in the Old Testament, but he was also a very human character and was not without his faults. Fracking may be a competitive way for oil companies to draw petroleum out of the ground, but there are also some considerations that should be made with respect to how fracking might impact the environment. Saudization may be the plan for most industries in Saudi Arabia, but the fact remains that when it comes to the health care industry in the Kingdom most nurse practitioners in the country are likely to remain expatriates. In this type of example, the topic sentence comes in the middle of the paragraph. It acts as a turn after a few preceding sentences; the remainder of the paragraph adheres to the topic. Nolan’s Batman was good. Schumacher’s was decent. Burton’s Batman was the best. Embodied by actor Michael Keaton, the (then) new Batman of 1989 re-invigorated not only the “World’s Greatest Detective” franchise but also spawned a new age of comic book films soon thereafter. One possible solution is to rewind the clock and try to reinstitute a traditional economy. Another possibility is to give the free market a chance. However, the current climate is likely to win the day, and that climate is firmly geared towards plowing ahead with a command economy. The control of resources is the main aim in a command economy, and everywhere one looks the same story can be seen: wars over resources, from here to Tripoli. Prufrock’s love song is at once facetious and belittling. It is also somewhat moving and sympathetic, in an off sort of way. Most importantly, though, it is hypnotic. The repetition of sounds and lines—“The women come and go talking of Michelangelo”—does what all good poetry does: it seduces the ear. Prufrock’s love song is, in this regard, a siren song. It hypnotizes the reader, puts him to sleep, and lures him to the fate that Odysseus tried to avoid when he had his men tie him to the mast. Yet Eliot wants the reader to crash upon the rocks and, in fact, to “drown”—because it is only then that real humanity can be reached—only then that “human voices wake us,” which is, ironically, the one thing the Prufrock fears: the actual intimacy of real human connection. Writing a topic sentence is as important to composing an overall essay as any other element of essay construction. Whether you are writing a research paper, an informative essay or a personal narrative, you’ll need to know how to craft a topic sentence to make your paper effective. No matter what type of paper you are tasked with writing, knowing the fundamentals are essential. That is why understanding how to craft a topic sentence and comprehending what it does in a paragraph are so important. 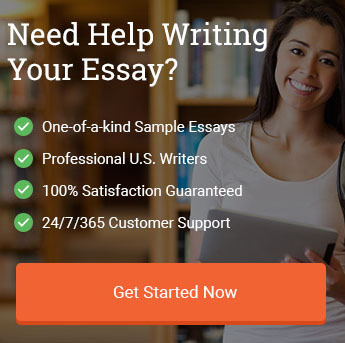 They are part of the tool set that you will use to strengthen you essay writing. 2) To relate that paragraph to the overall thesis of the paper. Give your topic sentence a neat hook to keep your reader interested. Use the topic sentence to relate a new paragraph back to the thesis of the paper. Put the topic sentence in the form of a question to break up monotony of style. Use transitions in your topic sentence to bridge two paragraphs. 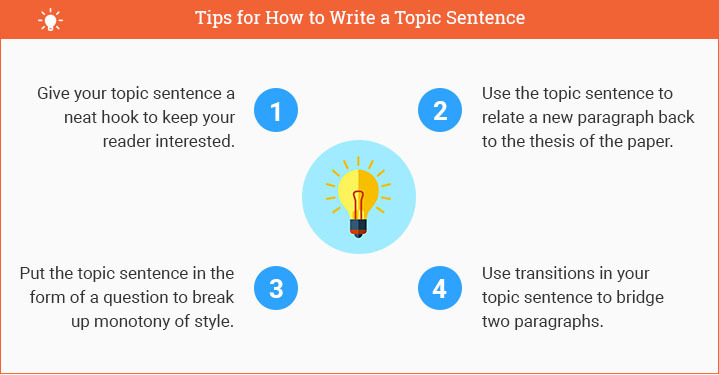 "How to Write a Topic Sentence." Aceyourpaper.com. Student Network Resources Inc, 16 October. 2017. Web. 20 April 2019. Student Network Resources Inc. "How to Write a Topic Sentence." Aceyourpaper.com. https://www.aceyourpaper.com/essay-writing/topic-sentence/ (accessed April 20, 2019).